Perusing artful heritage, a sense of timelessness so often present in our comforting environments we are warmed with nostalgic memories. One classic example is the cosy little hideaway Bemelmans’ Bar, in The Carlyle Hotel of Manhattan’s Upper East Side, It is a sophisticated and whimsical icon honoring New York Style with Art Deco flair. The bar was named after Ludwig Bemelman, creator of the enormously popular and beautiful Madeline children’s book series. Bemelman was also a successful artist working for The New Yorker, Vogue and Town and Country. Bemelman transformed the bar in 1947 with nostalgic and clever hand painted scenes of Central Park. In exchange, he was granted residency for one and a half years in the hotel. The artful wit and whimsicality of the bar oozes a sense of quiet comfort, a warm and gentle abode. The heritage of the walls in this Upper East Side establishment evokes a sense of timeless grandeur, of an artistic adventure painted in living memory. In the fabulous words of Bemelman, “Tell them it was wonderful!”. 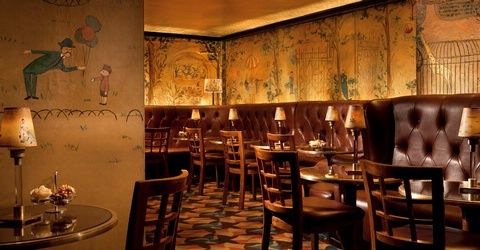 Photo’s of Bemelmans Bar courtesy of The Carlyle, A Rosewood Hotel.